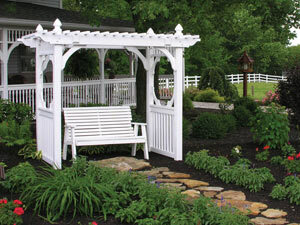 With cities becoming concrete jungles, your front lawn or backyard garden can be a lush and pleasant oasis where you can relax with your spouse and enjoy watching your children play in the yard. Opting for sturdy LuxCraft benches will help you make your outdoor space more hospitable and functional without costing a small fortune. 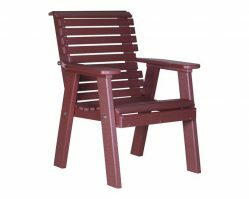 Outdoor patio furniture near Youngstown Ohio that’s made out of recycled plastic is the perfect alternative to rusting metal or faded cracked wood furniture. No matter how hard you try, you just can’t protect your outdoor patio furniture from damage caused by normal weather and UV radiation. 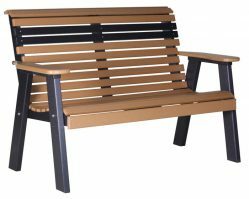 Unlike wooden furniture that will expand when wet and can become disfigured during hot days, poly lumber furniture will retain its shape, strength, color, and appearance throughout the years. 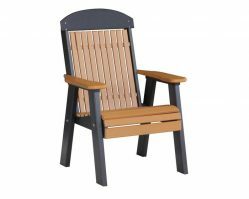 This means you can enjoy your patio furniture in any season’s evenings without having to lug chairs or benches back and forth from your storage space to keep them protected. Also important, LuxCraft furniture gives you an opportunity to feel good about doing your part to help protect the environment. Made entirely out of recycled plastic, you can enjoy the satisfaction of having a quality product made from water bottle waste that otherwise would have ended up in landfills, and for saving trees that otherwise would have been cut and processed into furniture. Of course, LuxCraft green products don’t require you to compromise on quality, longevity or functionality. A lifetime guarantee is clear proof that this investment is going to last as long as your house, if not longer. 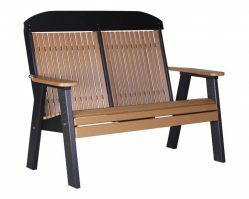 With great value for the money, buying outdoor furniture made from recycled plastic is a smart, sensible, and a long-lasting investment.